The four product offers include Secure® fungicide, Divanem® nematicide, Briskway® fungicide and Primo Maxx® plant growth regulator, as well as select multipak configurations containing these products. Participants that qualified for the 2018 GreenTrust® 365 Program last fall will continue to earn their yearlong rebate on purchases of Qualifying Products, including this seasonal program, through September 30, 2018. For more information about the in-season program offer, including full terms and conditions, visit GreenCastOnline.com/SeasonalProgram. 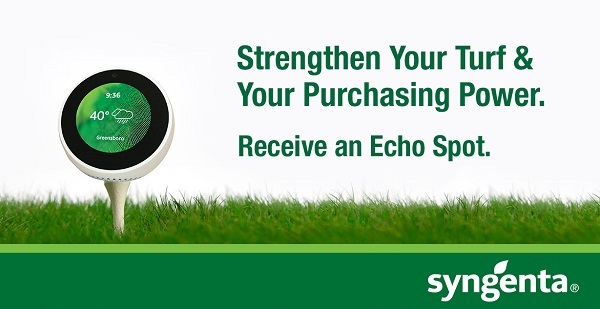 *Limit two per offer with potential to earn up to 8 Echo Spot, Alexa-enabled screens, if Eligible Participant qualifies for all four offers two times. ©2018 Syngenta, 410 Swing Road, Greensboro, NC 27409. Important: Always read and follow label instructions. Some products may not be registered for sale or use in all states or counties and/or may have state-specific use requirements. Please check with your local extension service to ensure registration and proper use. Divanem is a Restricted Use Pesticide. Briskway®, Divanem®, GreenTrust®, Primo Maxx®, the Alliance Frame and the Syngenta logo are trademarks of a Syngenta Group Company. Amazon, Echo, Alexa, and all related logos are trademarks of Amazon.com, Inc. or its affiliates. Amazon and Echo Spot are not affiliated with and are not sponsors of this Program. Secure® is a registered trademark of Ishihara Sangyo Kaisha, LTD. All other trademarks used herein are the property of their respective company.